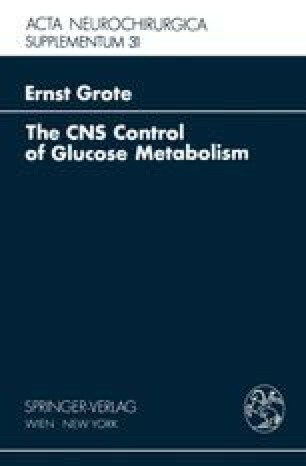 The investigations presented here on the regulation of glucose metabolism were undertaken in the years 1972 to 1975 on a total of 207 people. Among these were 158 test subjects on whom 240 glucose tolerance tests were performed. In 49 patients the spontaneous pattern as well as arginine and insulin stress were investigated. The subdivision into twelve groups was done according to clinical neurological and radiological criteria taking into consideration the main site of the injury and the level of the lesion. The formation of subgroups resulted from the necessary consideration of the time of the injury for the assessment of glucose metabolism.